Jay-Len Roberts is all about goals. As a forward for the WPU Men’s Basketball team, it’s Roberts’ job to make field goals, and as a student it’s his job to make good grades and graduate. However, some of the greatest goals aren’t the ones that others set for us, but the ones we set for ourselves. This is what makes Jay-Len Roberts a special student and how his idea for a university club transformed into a truly unique business idea. In the second half of the spring semester, a time when some college students are having to up their game to stay focused and finish strong, Roberts is working hard on his classwork and simultaneously pitching business concepts to a panel of small-business incubators in the recent Idea Generation Next Competition, a competition for Triangle-area college students designed to encourage and promote new ideas committed to addressing social issues. Roberts finished in the top 14 in the competition, having competed against dozens of students from other top universities in the area in pitching his idea for a “pop-up” restaurant. Roberts made the first cut which narrowed the competitors down to 40 students, and again made it to an accelerated final round where he and only 14 other finalists remained, an experience he speaks proudly of. But how did the idea for a WPU club transform into a competitive business idea? Because Jay-Len set a goal for himself which he needed to achieve. Well before the IGN competition, Roberts knew that he wanted to leave his mark on the University in a way that would give back to the local community and to the next generation of thinkers who would come after him. 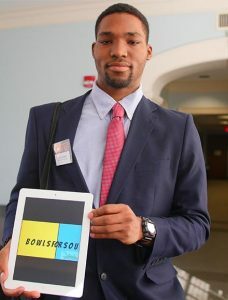 At the advice of the WPU Director of Student Involvement, Roberts came up with an idea for a club called Universal Connections. It was his intent that this club would align professionals from around the community with students ranging from grade school through college. His proposed club would allow for members of the local professional community to share intangible resources and knowledge with students to help pave the way for the next generation of entrepreneurs and innovators. Student-athlete, Jay-Len Roberts, refines his presentation for the Generation Next Competition. Roberts believes that a club like Universal Connections would be extremely beneficial to kids who do not necessarily come from the best economic situations. He also believes that besides hard work, the best way for children to escape poverty is education through the proper connections and networking. Before Roberts’ club could come to life, he was intercepted by Chris Baker, WPU’s AmeriCorp Vista Volunteer Coordinator, who knew of a local competition that was exactly up Roberts’ alley. Roberts took his idea and ran with it. His pitch is built on the core belief that the complex and divisive issues our nation faces today can eventually be solved by working locally to bring people together with an idea as simple as cereal. Yes, cereal. Roberts shows off his presentation for his business pitch, Bowls For Souls. Roberts admits that he’s always wanted to start and run a cereal bar, a place that would bring people together for food and conversation. He imagines his customers choosing from a vast array of cereals to dine from and all within an environment as comfortable as their own homes, complete with cartoons playing on the TVs. Roberts’ idea may seem rather simple, but he and the other finalists met regularly at Citrix to work on their pitches and to run them through various small-business exercises, creating things like idea maps and smart-achievable goals. It was in these workshops where Roberts learned how to simplify his business idea into a pop-up restaurant and he gained the experience he would need to point his start-up in the right direction. Since the competition, Jay-Len has already applied what he’s learned and partnered with Sodexo, WPU’s food services provider, to bring his pop-up cereal bar to campus. It’s here at WPU, that he’ll put his ideas into action for a community service event with the hopes of furthering the relationship between community service and education. Roberts wants to use his cereal bar to partner a different school with a different charitable organization each weekend. He believes that education and community service organizations should go hand-in-hand since they share common goals. Although Roberts didn’t finish first in the competition, he wants to see how far he can take his idea and has even been granted a small sum of money from a representative from Apple Inc. to further pursue his business plan.